Generations of residents and general surgeons have relied upon and worn out their copies of Surgical Anatomy and Technique: A Pocket Manual. Thoroughly revised and with dozens of new illustrations, the fourth edition continues the tradition of providing a concise, accessible, and generously illustrated memory refresher for both novice and experienced clinicians. The editors have included techniques to keep the content fresh, relevant, and practice-based. Among the new topics are hand surgery, a section on central venous access, and creating an AV fistula for dialysis. All the existing chapters have been updated and expanded to reflect current surgical approaches and instrumentation. 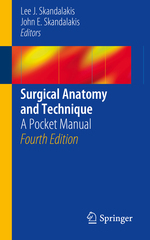 This fourth edition of Surgical Anatomy and Technique: A Pocket Manual provides the gold standard in correlating clear, practical anatomy with the correct technique in the pursuit of the best possible patient outcomes. This handy pocket manual remains a 'must have' for every resident and general surgeon.